Sigma-Aldrich, a part of MilliporeSigma, strives to provide you with the newest and the most hard-to-find FEMA flavor ingredients. 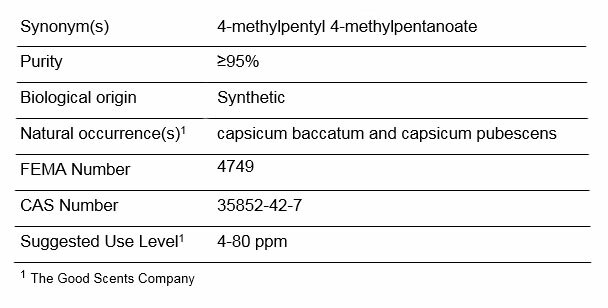 We manufacturer our 4-methylpentyl 4-methylvalerate so that it has clean and delightful nuances for fruity and herbal formulations. This flavor ingredient has many applications from baked goods, chewing gum, dairy, coffee and teas. Fill out the request information form on the right to receive a sample. We are devoted to supplying safe, delectable products with transparent and easily accessible documentation to our customers around the globe. The next time you are looking for FEMA-approved ingredients, start your search with us. The life science business of Merck KGaA, Darmstadt, Germany, operates as MilliporeSigma in the U. S. and Canada.